Attorney Steve Snyder, left, listens Monday at the Warsaw Plan Commission meeting as Assistant City Planner Justin Taylor discusses plans for a development involving a John Deere dealership near US 30. The plan commission approved the preliminary plat. 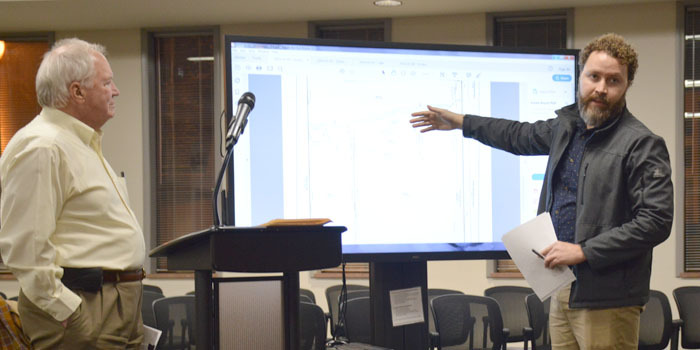 WARSAW — The developer behind a future John Deere dealership along US 30 in Warsaw made more progress in its plans Monday night, Feb. 11, before the Warsaw Plan Commission. Everything, that is, but a proposed road name. Officials announced late last year plans to construct a John Deere commercial development in part of the expanding Warsaw Technology Park just west of CR 200W. The Greenmark development involves 21.25 acres northwest of the highway and CR 200W that will be divided into four lots. The nationally-known implement dealer is the first to announce plans for intentions within the proposed plan. The development involves extending an east-west road known as Polk Drive north of the highway further to the west beyond CR 200W. City Planner Jeremy Skinner and the plan commission balked at that idea. The board approved the preliminary plat, but not before amending it to keep the name of the extended road as Polk Drive. Skinner said developers behind residential and commercial projects often seek to name new roads, but the fact this is a road extension made the difference. “I don’t blame them for trying,” Skinner said. Board member Rick Keeven said the desire to name an extended road differently was the first he could recall. He also noted that agreeing to the request would set a precedent. The road will initially extend about 300 feet to serve the dealership, Snyder said. The agreement seeks to extend water and sewer and expanded right of way to accommodate the utilities. The proposal still awaits final plat approval. Approved a preliminary and final plat for an R3-zoned area that combines three lots that are a total of 2.3 acres along Mariners Drive. The plan is being sought by Craig Snow, representing Silveus, LLC. Approved a preliminary and final plat approval for Lake City Properties along Orthopedic Drive. The property is north of a new hotel. The applicant is Bill Cupp, representing Lake City Properties, LLC. Approved a preliminary plat that creates three new lots that are part of 9.4 acres near CR 300N and Escalade Way. The tract includes a cul-de-sac at the south end of Escalade Way. The land is west of SR 15 and north of the Nissan dealership.